New Living Organ Donation Collaboration Announced at White House Organ SummitJohns Hopkins University, National Kidney Foundation and Novartis team up to help patients findJune 13, 2016—New York, NY—At the White House Organ Summit today the National KidneyFoundation (NKF) announced a new collaboration with Johns Hopkins University and Novartis to nationally launch the Live Donor Champion Program. Developed by transplant surgeon Dr. Dorry Segev at Johns Hopkins University, the Live Donor Champion Program aims to overcome common barriers to finding a living kidney donor—a need for more education about living donation; and are luctance to start a conversation about donation among transplant candidates.Working with Johns Hopkins University and Novartis, National Kidney Foundation will use its vast networks to disseminate a comprehensive set of educational resources to transplant centers nationwide. The Champions program will teach people how to use their own personal connections and social networks to raise awareness about the need for kidney donors; and help to identify potential live donor candidates for a family member, friend or themselves.“While patients are often hesitant to discuss their need for a transplant, friends and family members are eager to spread the word about the possibility of donation and want to be an advocate—a champion—for the patient,” said Kevin Longino, CEO of National Kidney Foundation. According toJohns Hopkins University research, the Champions program increased living donation rates in pilot tests by approximately 50%. “Helping our patients increase their chances of receiving a kidney transplant is critical to our mission; and we are pleased to be working with Johns Hopkins University and Novartis in delivering this program to patients nationwide,” added Longino. There are more than 100,000 people waiting to receive a kidney transplant. In 2015 alone, more than 4,000 patients died waiting. 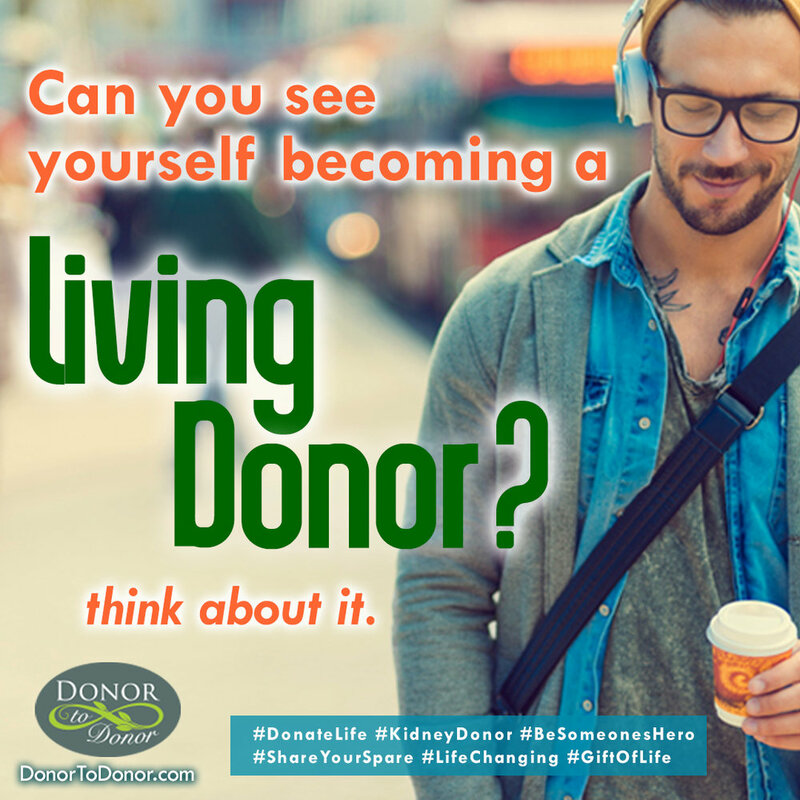 Nearly one third of the 18,000 transplants performed each year are made possible by living donors. In addition to this newly announced collaboration, National Kidney Foundation offers several other resources to patients considering living kidney donation. The Big Ask, The Big Give is a multi-media public awareness campaign which complements the Live Donor Champion training program. This educational campaign promotes awareness of living kidney donation for both the kidney patients who have difficulty asking someone to consider a kidney donation (The Big Ask) and potential donors (The Big Give). Free for patients and professionals, the program provides factual, unbiased information addressing common concerns and offers support in making a decision about living kidney donation. The Big Ask, The Big Give has been pilot tested in the Atlanta area, and will be rolled out nation wide to transplant centers, dialysis centers and nephrology practices this fall. The foundation also offers a peer mentoring program, NKF Peers, a telephone support program which connects those affected by kidney disease with an informed and supportive mentor who has already been through the experience. These “mentors” are trained to help kidney patients, transplant recipients, people on the transplant waiting list, living donors, or people considering living donation.This toll-free, confidential telephone network lets people speak with a person who knows and understands their concerns first-hand. For more information about The Big Ask, The Big Give or NKFPeers visit www.kidney.org/livingdonation, call 855-NKF-CARES or email nkfcares@kidney.org. to living donors. In addition, while some employers allow individuals to take leave from work to donate an organ; there is no federal protection to ensure job security for organ donors when they take time off for surgery and recovery. The Living Donor Protection Act would provide that national protection under the existing Family Medical Leave Act. In 2017, NKF will host a Consensus Conference on Kidney Discards to reduce the number of kidneys that are discarded in the U.S.—currently about 3,000 each year. This conference will bring together major leaders in organ donation and transplantation to identify reasons that donated kidneys are discarded and practical solutions to use these kidneys to save lives.About the Organ SummitThe White House-hosted Organ Summit is an essential step towards increasing access to organ transplants and reducing the organ waiting list. At the Organ Summit, the Administration and private entities announced a new set of actions that will build on the Administration’s previous accomplishments to improve outcomes for individuals waiting for organ transplants and improve support for living donors. 1 in 3 American adults is at risk for kidney disease. 26 million American adults have kidney disease—and most aren’t aware of it. Risk factors for kidney disease include diabetes, high blood pressure, family history, and age 60+. People of African American; Hispanic; Asian; or PacificIslander descent are at increased risk for developing the disease. African Americans are 3 1⁄2 times more likely, and Hispanics 1 1⁄2 times more likely, to experience kidney failure.The National Kidney Foundation (NKF) is the largest, most comprehensive and longstanding organization dedicated to the awareness, prevention and treatment of kidney disease. For more information about the NKF visit www.kidney.org. Editor’s Note: Kevin Longino, CEO of National Kidney Foundation is a kidney transplant recipient, and will be available for press interviews. In addition, patients who have received live kidney donation, as well as living donors, will be available for interviews. Please use media contacts noted on page 1 of this release.